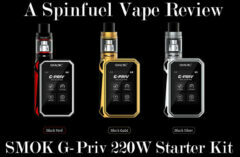 Spinfuel Preview: SMOK T PRIV Full Kit – Looking to capture yet a little more of the vape industry, SMOK is about to release its newest 220W box mod as a standalone mod, and as a full kit, equipped with the SMOK TFV8 Big Baby Sub-Ohm Tank. In addition to the usual specs of a SMOK box mod, this, half “H Priv”, half “Alien 220”, half “something original”, the SMOK T PRIV TC 220W Kit is apt to be one of the most interesting, and successful box mods to come from SMOK in a while. 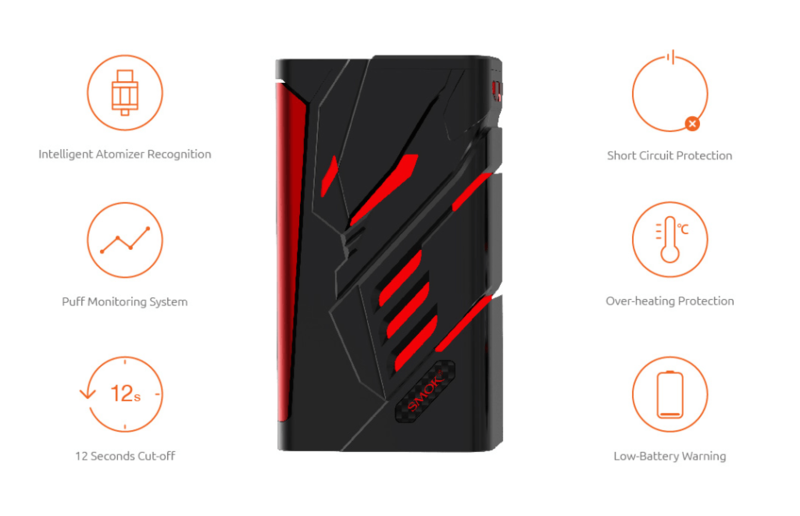 Below is a list of the expected features and specifications for the SMOK T PRIV box mod. As you can see above, nothing new inside except for one feature, built especially for the T PRIV; Adjustable LED Lights – Nine Different Color LEDs. In the photos that accompany this Preview you’ll see the portions of the body, slats in chassis, that allow for a light source to shine through. The user can choose 1 of 9 different colors that will shine through the slats in the body. We don’t have one yet, nor have we made the manual, but I suspect the light shines as the user presses the side panel firing button. 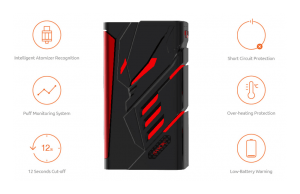 Other than this new 9-color LED lighting scheme, all SMOK box mods use the same specs and features, except for maximum wattage, which changes as needed. The biggest differences among SMOK box mods are the chassis, or body, and its power source. From the 4200mAh internal battery of the SMOK G150, to the 4x 18650 batteries needed to power the SMOK GX350, SMOKTech builds marvelous new vaping instruments that basically operate within the same technology, but are fashioned to appeal to the widest section of the vaping public. It is not just SMOK that is doing this, it’s all box mod manufacturers. The features and specs are set in stone, and now it’s up to the mod designers to present new models that can grab a slice of the market. Electronic Cigarettes are hardly the first industry to do this… just about every industry does the same thing. Still, although I already own most of SMOK’s lineup, and use more than half of them regularly, I’m still looking forward to the SMOK T PRIV. Like the SMOK H PRIV the OLED display sits atop the device, beside the 510-connector for the tank, and like the SMOK Alien 220 TC Box Mod, it is nearly the same size of the Alien, with a flush mount side firing button, and access to the two replaceable batteries under the chassis. The “Kit” version uses the SMOK TFV8 Big Baby Sub-Ohm Tank, one of my favorite tanks of all time. Smaller than the TFV8 Cloud Beast, larger than the TFV8 Baby Beast, the Big Baby sports 5mL juice capacity, and uses the same replacement coils of the baby beast. 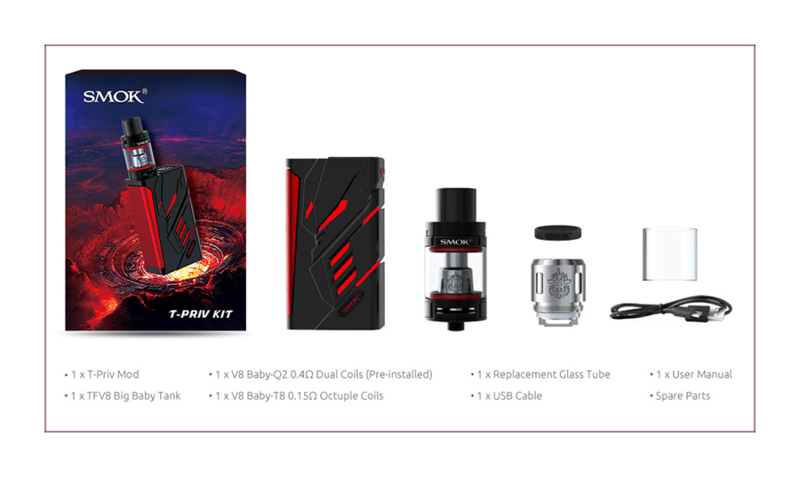 SMOK’s TFV8 Big Baby is the right tank for the T PRIV, but with 32mm diameter of depth, and 220W of power, the SMOK T PRIV can easily handle the TFV8 Cloud Beast and the TFV12 Cloud Beast King. From previous experience with SMOK box mods we are expecting another great mod with the T PRIV. Our plan is to spend 3 days with the T PRIV, using the TFV8 Big Baby as well as the rest of the SMOK Sub-Ohm Tank line, and perhaps spend some time with other tanks, from the MELO 300 to the Innokin Scion. By the time our review is complete, you’ll know what to expect should you decide to purchase one. 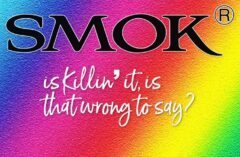 SMOKTech Is Killin’ It, Is It Wrong to Say That?